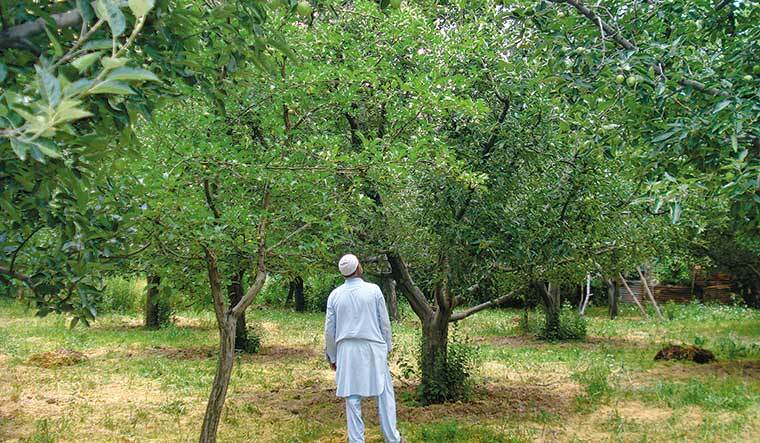 Green zone: Nizamuddin Bhat, in his apple orchard in Thuman Bawar, Pulwama. Karimabad village in Pulwama in south Kashmir, the ground zero of the separatist movement, has seldom seen a day of peace after the killing of Hizbul Mujahideen commander Burhan Wani in the summer of 2016. Things, however, have quietened down following the Union government’s announcement of suspension of operations against militants during Ramadan. The Army has not launched any cordon and search operation in the village since May 17, and a local resident said “everybody is focusing on their work”. Home Minister Rajnath Singh on his visit to Jammu and Kashmir in June was told by the security brass that no civilian or militant had been killed during Ramadan. It is believed that the ‘ceasefire’ would be extended till the end of the Amarnath Yatra, which starts on June 28. The ceasefire has improved the business climate, increased attendance in offices and schools, and allowed people to move freely without the fear of getting caught in clashes or being hit by stray bullets or pellets. It has also helped export the season’s first crop, cherry, on time, for the first time in three years. “From January to March, we had hardly 35 to 40 working days,’’ said Zubair Ahmed Turray, president of Shopian Traders and Manufacturers Federation. “Except one day, the markets were open in the month of Ramadan.’’ Another grower said his two children could for the first time in three months attend school without disruption. The lull in hostility has also allowed the politicians to reach out. Peoples Democratic Party MLA from Wachi, Ajiaz Mir, held a public darbar (meeting) and interacted with the people and party workers for the first time this year on May 23. “A public darbar was long overdue,” Mir told THE WEEK. He also inaugurated a steel bridge at Zainapora. M.Y. Tarigami, CPI(M) MLA from Kulgam, held a public meeting for the first time this year. “The ceasefire has eased the situation,’’ he said. Those who support the ceasefire argue that the killing of militants feeds the cycle of violence and pushes more boys to militancy. A confidential report by state police CID titled ‘Radicalisation and Terrorism in J&K’ says, “New age militant comes from... a normal Kashmiri family. He has Hanafiya inclination and not Salafi (or Wahhabi), has been educated in government schools and not madrassas. This militant is not a child from a broken family.” The report stresses that killing of militants was attracting more youth to militancy. Chief Minister Mehbooba Mufti may take the report to Rajnath Singh on June 14 and press for ceasefire extension. The lobby that opposes the extension, sources said, was of security officers who felt they would become irrelevant if the situation in Kashmir improved.